Entering the 1980s, it is hard to believe that it is now more than six years since the last "boom" in the big bulk carrier market was ended by the "Oil Crisis," and an abrupt change in the trading pattern of the combined fleet. For much of this period, operators of big bulk carriers—and by "big" one means a ship of at least "Panamax" size— sustained heavy losses. However, over the past year or so, the market has undergone a remarkable transformation, with freight rates obtained by large carriers again rising to profitable levels. Hampton Roads-Japan has hit $18.50 and is still rising, while in the Gulf-Holland grain trade, the going rate for large shipments is $16.50-$17.50 per ton. Even more encouraging is the level of "spot" rates in the iron ore trade, with up to $12.50 being conceded for 100,000-ton shipments of Brazilian ore to Europe. Present charter rates do, of course, reflect cost increases, currency changes and the enormous increase in the price of bunkers, but there is no doubt that the market for large bulk carriers has completely changed, with most vessels actively employed in this sector operating profitably. To take one example, a 120,000-tonner can expect to earn up to $15 a ton on FIO terms for the 13,800- mile, 40-day haul from Australia to, say Italy, voyaging round the Cape. The costs, including the ballast voyage from Japan, are likely to be in the vicinity of U.S. $1.4 mill i o n— equivalent to $12 a ton — with fuel accounting for up to 35 percent of the total outgoings. Of course, much depends on the level of capital charges, as well as crew costs, but operators of big bulkers are in a much stronger position financially, with freights twice, or three times the levels seen in the first half of 1978. Big bulkers have, in fact, benefited most from the market upturn, although this is best illustrated by the trend in one-year time-charter rates (U.S. Dollars per DWT Month) : These rates are simply an indication of what charterers would have been prepared to concede to secure suitable tonnage for about a year's trading, but the popular "Panamax" (±65,000-dwt) size can currently expect to earn up to $13,500 daily while on period charter. For tonnage in the ±120,000- dwt category, a hire rate of $15,500 daily would be a reasonable expectation, the revenue permitting most owners to meet repayment of capital, as well as all operating expenses. Typically, operating costs of this class of bulk carrier are in the range US$5,500-$6,000 daily, and unless the capital charges are exceptionally heavy (which would only apply if the ship was newly built), there should be a profit from present trading operations. 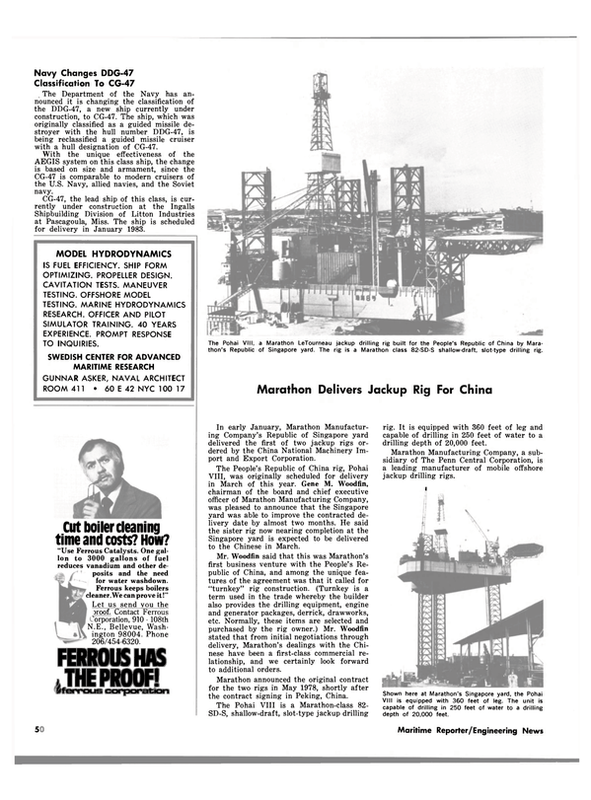 Initially, the response to the market's rise was increased interest in secondhand tonnage, many large bulk carriers and OBOs changing hands in the second half of 1978 at what can now be seen to have been extremely attractive prices. This speculative activity certainly paid off, as the value of early 1970s-built tonnage in the ±120,000- dwt class has risen from $6 million to $18 million over the past 18 months. Inevitably, with less good-class tonnage for sale, interest has focused increasingly on newbuildings, and in recent months there has been a spate of orders for both "Panamaxes" and large carriers of up to 150,000 dwt. Since mid- 1979, over 3.5 million dwt has been added to the orderbook, mainly by established owners seeking to enlarge or replace their fleets. Characteristically, those owners with a "tramping" philosophy have been hedging their bets, and going for good standard design bulk carriers in the "Panamax" class. For a time, such ships could have been contracted from Far Eastern yards for as little as $18 million, and cheapness, combined with the flexibility of the "Panamax," was very much a factor. Prices have moved up as berths have filled, however, rising to between $24-27 million in the Far East, and to over $30 million in Western Europe, but orders continue to be placed. The Danish B & W yard — which built a long series in the early 1970s — is one of those back in the business of building "Panamaxes," having recently obtained contracts for five ships from Norwegian and Hong Kong owners. The flexibility offered by the low-draft "Panamax"—preferably one of ±65,000 dwt —has obvious attractions for the 1980s, but major owners with either "captive" cargo, or long-term freight contracts for ore or coal, are more inclined to see the ±120,000- dwt class as the most economic ship for longhaul trading. A major factor in their thinking is the forecast growth of "steam" coal shipments through the 1980s, although the 120,000-tonner is also well-suited to ore trading. Already, quite a few contracts for ships of this size have been confirmed, and in most instances, the owner will use the ship, when built, to service coal contracts. The Shell group — which now has extensive interests in coal, notably in Southern Africa — is behind a number of these newbuildings, and has itself contracted for two 120,000-tonners in South Korea. The price was reportedly over $30 million per ship, but $37-39 million is now being quoted by Japanese shipyards for 1982 delivery. Nevertheless, the level of enquiry suggests that further orders for bulk carriers of » 120,000 dwt will be confirmed, both in the Far East and Europe, by major independent owners or coal shipping interests located in South Africa or Australia. For example, as many as eight ships of ±120,000 dwt may be needed to haul South African coal to Israel, four being operated by Safmarine and four by Zim Israel. Australian interests have also been actively negotiating for coal carriers. Ore carriers are an altogether different proposition, as the next generation will be considerably larger than the last, and very much more expensive. What the trade needs is more carriers in the : 250,000-dwt class, but owners — even those with contracts for long-haul shipments — are reluctant to make such an investment. This is hardly surpris- ing, as there is still a large amount of "reserve" ore-carrying capacity in the combined carrier fleet which could be brought into use. Owners are also hesitating because ore trade may grow relatively slowly in the early 1980s, and the recent performance of the steel industry has done nothing to alter that view. Significantly, there have been few orders for combined carriers, and those that have materialized have virtually all been "Panamax" OBOs. Despite the high cost, there are those who see the ±160,000-dwt OBO as the most efficient type/size for combining the ore, coal and oil trades, and one must admit that such a ship might be a better investment than an ore-oil ship of +250,000 dwt, which is restricted by draft to a few long-haul trades. The deepening of the Suez Canal will add a new dimension to the employment of the large OBO, which is more broadly based than it was when the first ships of this size entered service in the early 1970s. However, the price of a new 160,000- ton OBO in Japan would probably be $43-45 million, and the prospective owner (and his banker) would think long and hard before ordering such a ship. For further information, write P.J. Rowbotham, II.P. Drewry Ltd., 34 Brook Street, Mayfair, London W1Y 2LL, England. Telephone 01-629-5362/5366.